The everyday PC user doesn't think much about its PC and problems that can cause critical damage to their data or other stuffs stored on Hard drive and other electronic parts until the problem actually occurs. Once a failure happens, the repairs can be costly and very time-consuming and one also have to sacrifice their data stored on hard drives if the damage is more severe! The user doesn't usually think about the maintenance of their PC until they start creating problems. However, their are many preventive measures that a user can take to decrease the chances of getting into the problems which could result in computer's smooth and efficient operation and also to lessen any damage that does occur despite best efforts to avoid failures. Computers themselves don't create problems, so it is very clear that humans are only responsible for any computer related problems. Computer errors can be of many types such as Programming errors, physical disorders, etc. Mainly error occurs due to human activity and sometimes because of physical location of your computer. Many computer users are unaware of the type of environment they should choose for their PCs so that it can function smoothly. Some of the combined factors affecting PCs are buildups of dust, over heating, magnetism, humidity, configuring windows registry or any program without having any knowledge of it, viruses from pen drives, internet, online sharing of files, static electric shocks, power surges, carelessness, incorrect handling of PC case or its CPU etc. There are even more factors which can cost much to computers. People generally neglects these small factors, which afterwards can create a very big problem. By taking small steps against any factors which you neglected earlier can result in super functioning of your computer. Now let get started on what you should do when a problem occurs. Whatever the problems occurs the first step should be to understand the root cause of the problem. Creating a chart will really help you. Write down the name of any part of computer/software creating problem. Just beside it write down the problem its creating. Also write down the causes which may have contributed it to malfunction. But if you are unaware of the problem and the risk level is between 0 - 5 you can take the help of internet by searching the solution or consulting online forums. And if the risk level is between 5 - 9 then you should get the help of any technician or expert. Preparing the above data in a tabular form is the best way to organize your problems and finding the solution very quickly. You can even show this data to any Expert to get advices regarding your solution. While cleaning up your hardware, the first thing which you should keep in your mind is that computer components have highly complex and delicate electronics. So you should handle it very carefully while assembling or while cleaning. Try to take maximum care just to ensure that you don't bend any components or drop anything. Don't keep your PC's cabinet open unnecessarily. This may result in electric shocks due to any external agent entering the case like spilling of liquid into the cabinet or any other material. Don't leave your computer's components lying around on floor, or on the edge of the shelf. Or otherwise anyone could accidentally step on or drop them. The PC/desktop freezes or reboots suddenly. This problem may occur if your RAM is not installed correctly or your PSU ( power supply unit ) is not supplying power correctly to the motherboard. The PC powers on but there is no display. So if you are facing any of these problems, then you should first see whether the components are fixed properly and are not under buildups of dust. If your software is creating problems and you have tried a lot of solutions to fix it but still not successful, the you should go for system restore. 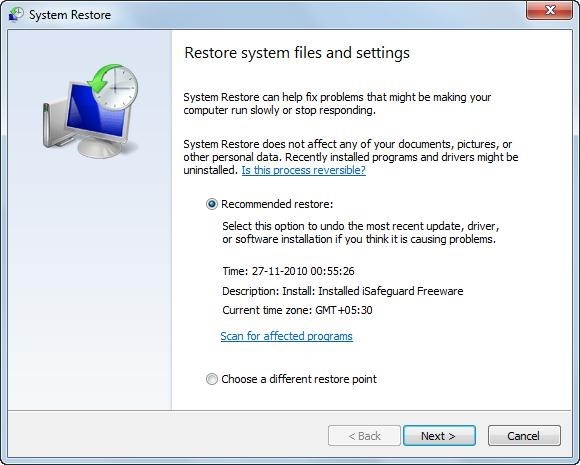 System restore tool restore your computer back to a restore point specified. If you will select "choose a different restore point", you will be provided with a list of dates. Choose that date and click on restore. But if you have never used it or are unfamiliar with this tool then go for "recommended Restore" option. CCleaner - CCleaner is a freeware software which allows you to clean up your computer. Its has lot of functions to keep your PC out of problems. 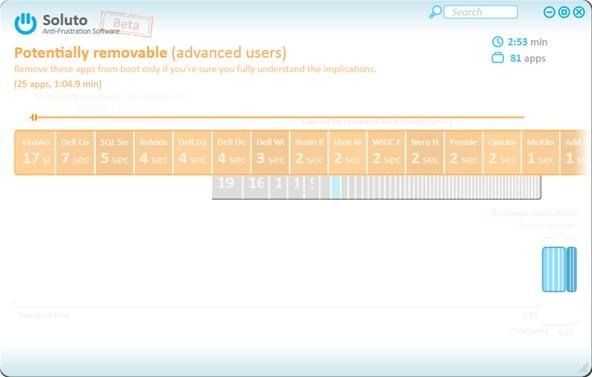 Soluto - This software is generally known as Anti-Frustration Software. It will speed up the booting process of your operating system. The interface of this software is awesome, very easy to use and too suggests what you should do to a particular application which run during the boot-up. Backup Maker - You can use this application to backup your data and protect it from sudden system crashes. It offers a very good set of features. You can assign a task to this application which will run itself without getting you in the trouble. The BIOS ( Basic Input/Output System ) is the software code that first runs when your PC is turned ON. It contains all the information necessary for starting up the PC. SOLUTION - The most common reason for this problems is a improper or loose connections or incorrect jumper settings on the device. Check that all cables of hard disk, DVD/CD-ROM are connected well. Also check the jumper settings and BIOS settings for Primary and Secondary Boot device are correctly assigned. Time get changed every time PC is turned on. SOLUTION - The CMOS battery powers the real-time clock when PC is switched off. If time get changed every time PC is turned on, then there are possibilities that the battery is dead or not charged. Replacing the battery or keeping your PC turned on ( this should be only done when you have started your computer after a long time ) of some time can solve the problems. Note down the model number of your BIOS ( see your motherboard or BIOS settings ) and go to the manufacturer's website and search for the model and check whether it is flashable or not. When you are sure that your BIOS is flashable, then check your motherboard manufacturer's website for BIOS updates. Download the correct update. If you don't get flash program with the same update ( which will flash the updates ), then you can search it on the same site for it. Now-a-days flashing BIOS is very easy job if you follow the steps rightly as stated here or on your motherboard manufacturer's site. Ensure that you provide consistent power supply while flashing your BIOS or otherwise it will get damaged. DO the flashing of your BIOS at your own risk! Almost 90% of the computer users at-least spend 10 to 20 minutes on computers watching movies or listening to musics. But all the fun goes off when your media file is not supported by your player. VLC - This media player can handle almost everything! It comes with nearly every codec built in. 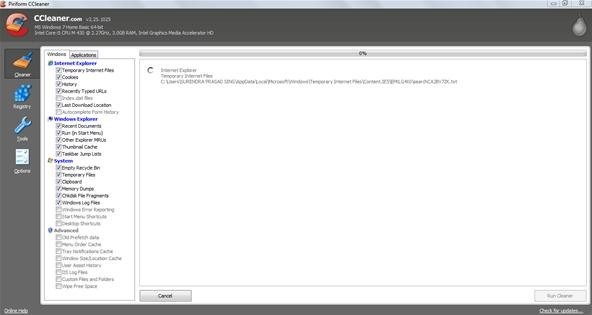 The most interesting feature of this media player is that it can play any files even if it is damaged! DivX player - You may need this while watching movies/Videos online. Do not store data files in the same directory that you store the sofware. Be very careful when moving your PC from one location to another. Buildups of dust can seriously affect your PC's performance and its ability to cool. As a result you will face hangups, sudden shut down. So keep it out of the dust. Keep your PC out of the humid area i.e, any water sources area that can splash onto the components or drip down into them. Don not place your PCs near any heating or cooling appliances. Do not defragment your hard disk frequently. Keeping your PC in good condition will help you save your money and time!